High-speed trains operated by China have covered tracks totaling 19,000 km last year, accounting for first place and 60 percent of the total mileage of high-speed trains in the world, China Daily reported. 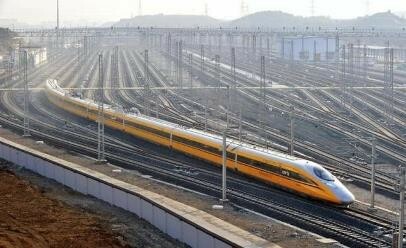 According to the report, China has spent 82 million yuan ($12.5 million) on fixed assets to operate 9,531 km of newly built train lines, which include 3,306 km of tracks for high-speed trains. Sheng Guangzu, general manager of China Railway Corporation (CRC), said that the railway network covers almost all cities with population of more than 500,000 in the country. Sheng added that 2.5 billion trips by railway were made last year, an increase of 10 percent for the third consecutive year. In addition, more than 60 percent of sales were online purchases of train tickets. The CRC general manager said that a demand-based ticket allocation system is being developed to solve the problem of major stations getting the most seats, resulting in some tickets remaining unsold while smaller stations fail to meet the demand. Sheng said the new mechanism would enable the agency to allocate tickets so every station, whether big or small, will have sufficient number of tickets available for the commuters. Between 2011 and 2015, a total 10.6 billion trips were made by rail, the report said. During the 12th Five-Year period, from 2011 to 2015, a total of 358 billion yuan had been invested into railway fixed assets, a 47.3-percent increase from that of the 11th Five-Year period. In addition, some 30,500 km of new lines have also been completed, up 109 percent from the 11th Five-Year period. Last year, the country also exported 815 trains to European countries, 165 percent more than in 2014. China is also set to build a railway network that will connect countries in Southeast Asia such as Thailand, Laos, Singapore and Vietnam.